In addition to a morning routine I have a nightly one too or a ritual you could call it. Dinner, a cup of decaf tea, the normal teeth brushing, lotioning of the hands and about an hour of reading in bed to decompress and settle in for bed. 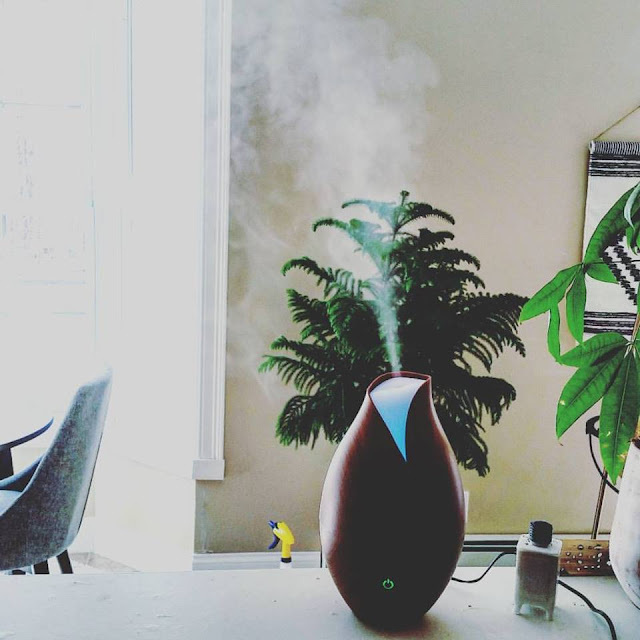 To this routine I have added the ritual of essential oil diffusing. 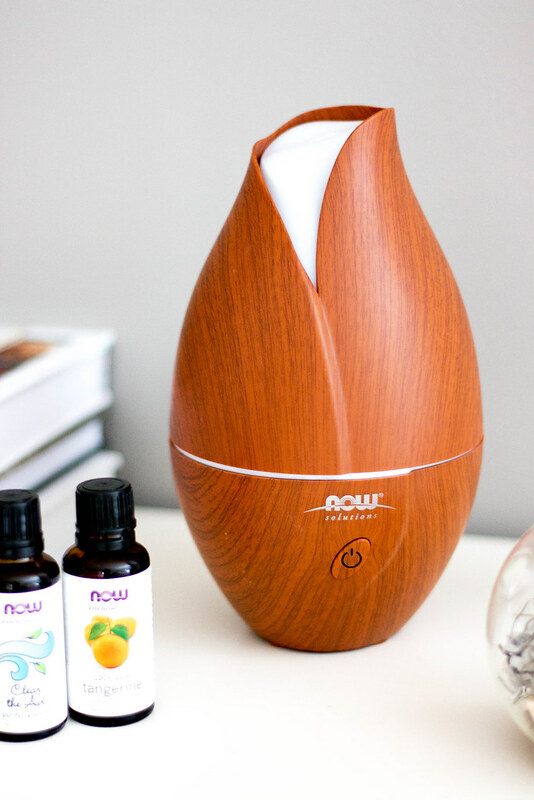 Through my partnership with NOW as a Wellness Influencer I was able to get my hands on my very own diffuser. 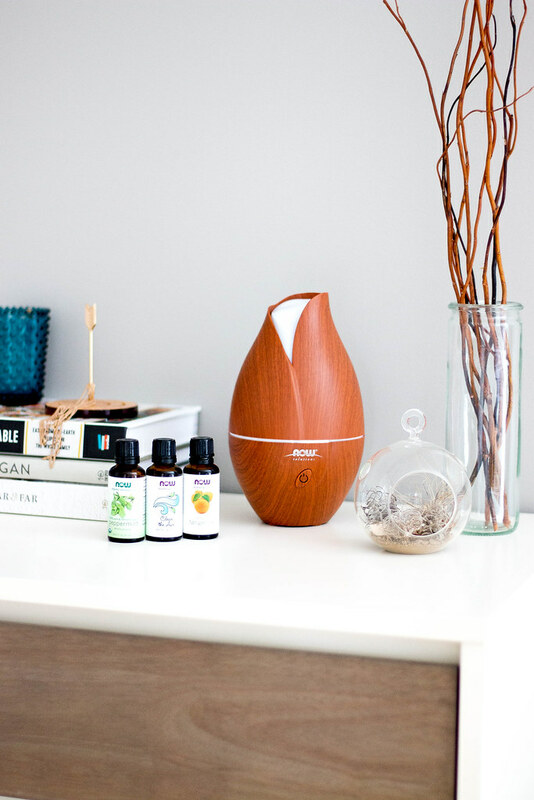 It was love at first sight when I saw the Faux Wood Diffuser, it is even prettier in person. I had never used a diffuser before and was a little uncertain how it would work- but it is super easy! Drops of essential oil are dropped into the water basin with luke warm tap water, then screwed into the base. Press the power button and instant essential oil mist is born, which has an added benefit of adding moisture to the air as well. There are 2 settings, one with a night light and one without. I love the Clean Air Blend at night and am in love with the Tangerine during the waking hours. The tangerine essential oil is also heavenly in a warm bath with epsom salts + baking soda- it makes the entire bathroom smell amazing! 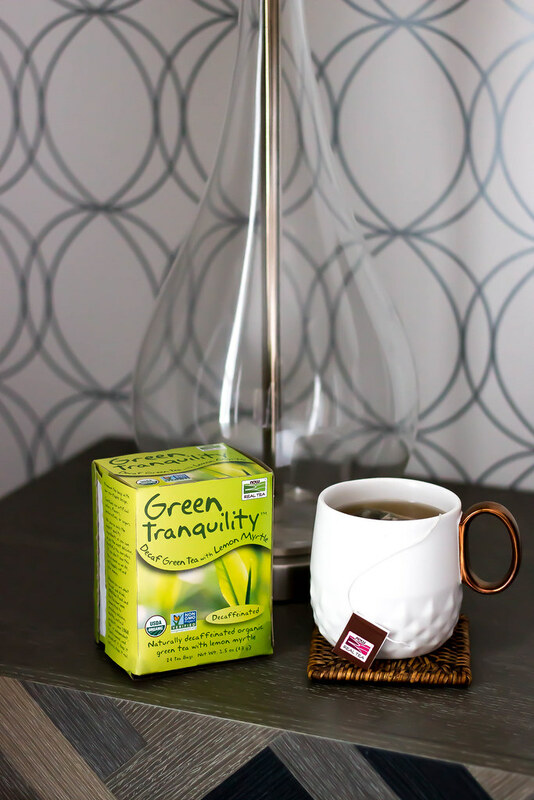 My go to nightly tea as of late has been the Green Tranquility - it is perfect for unwinding at the end of a long day. I would love for you to experience oil diffusing in your own home along with a cup of relaxing tea! Now Solutions is giving one lucky reader the following! Love Essential Oil Blends? Check out NOW Solutions Relaxing Blends you can make on your own! I love a cup of chamomile before bed and a cup (or three) of coffee in the morning. I can't believe you vacuum everyday! That's something that only happens every one or two weeks at our house, and 100% of the time it's my husband doing it. I'm glad that he vacuums, but it's not something that ever occurs to me. Before bed I do some stretching and relaxation. I hit the coffee as soon as my feet hit the floor. PS: My hubby vacuums every day! Can you believe it?!? I have always wanted to get into the habit of stretching before bed- this needs to become part of my routine! I drink peppermint tea at night and I have prayer time in the morning. Oooh, I would love to win this one! Right now we are trying to get a good bedtime routine down for Felix so he will (hopefully!) start sleeping through the night. 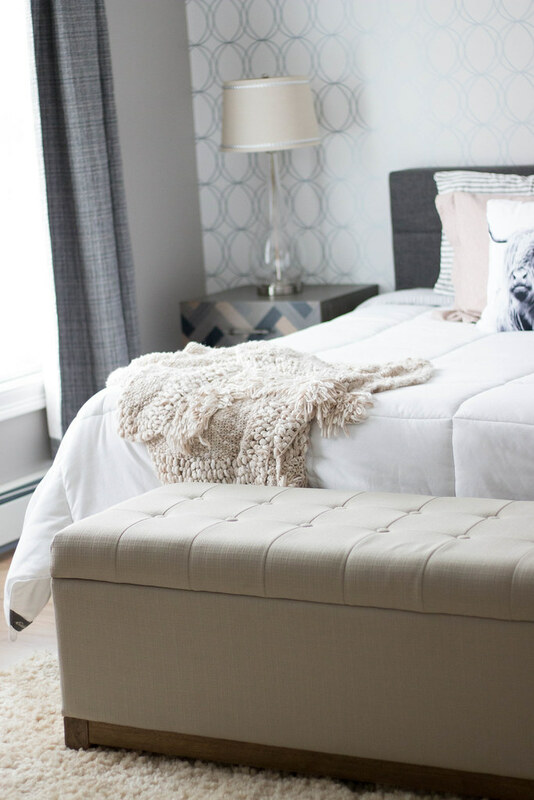 This would be the perfect addition, especially since the diffuser could also act as a night light! And the tea could be our celebration for when he goes down. A girl can dream, right? I hope you do! The nightlight feature is awesome- it would be the perfect ritual for felix + you! Most importantly, I always start the day with lemon water and then green tea. And I always, always wind down with reading in bed before I turn the lights out. Otherwise I just never seem to relax! We have almost identical routines morning + night! I always end my day with a bath (usually with bath salts or lavender oil) and then reading in bed. Turning off screens has been so helpful & I get a lot more reading time in. Just reading that is making me feel relaxed! The only electronic I bring in the bedroom is my Kindle for reading only, it make such a huge difference in terms of unwinding before bed if I don't have access to my phone or Ipad. i use a humidifier and drink tea before bed! Tea seems to be part of everyone's ritual! Thanks for the chance. In the evenings I like to do a little crafting with chamomile tea and try to head to bed without electronics. I love a nightly cup of tea with a magazine to read! My nightly ritual is always reading on my kindle and I love to enjoy a little sweet treat too. Wow. I really like the diffuser. I love, love, love grapefruit. I made body lotion and hand soap with my oil too. Nights are reading with my black tea. I call it wind down time. Lol. I'll have to try the grapefruit - thanks for sharing! Reading has been a nighttime ritual for me since I was a little kid. Especially on nights when I have trouble falling asleep, curling up in bed with some tea or hot cocoa and a good book is a surefire way to relax and unwind.